How powerful would it be if, as a mortgage professional, you could tell when someone looking to refinance their home was unsatisfied with their current mortgage broker? Or if another person is questioning something about the rate they got from the broker they are currently with? Or what if you could tell when someone was interested in buying a home in your city? All of this type of information is invaluable to any mortgage professional. These are hot hot hot leads, people that need your help right now. Well these same people are putting this information right out there on the internet for anyone to see; you just have to know where to look. I will be the first to admit; at first I thought Twitter was stupid. In fact, I am still not 100% sold on it. I have found ways to make it work for me for my business, but why hundreds of thousands of regular people use it every day to announce to the world what they are doing at that particular moment really does not make sense to me. That being said, if people want to tell the world they need the service I provide and I know how to find them telling the world that, then that is a positive thing for my business. So without much further adieu; I introduce to you Tweet Grid. There are multiple social search engines designed to search your various social networking sites that can in some form or another yield similar results as Tweet Grid. 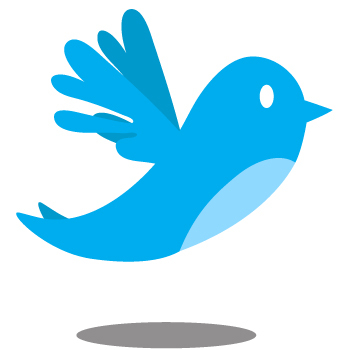 However, Tweet Grid does not function like a normal search engine, other than the fact that you don't need to setup any kind of an account to use it and it is free. It is (as the name suggests) a grid where you can type in multiple search phrases and the results are fed in to the grid in real time. In other words, you don't search for one thing, see your results, and then search for another thing (refreshing the page), see your results, and so on. 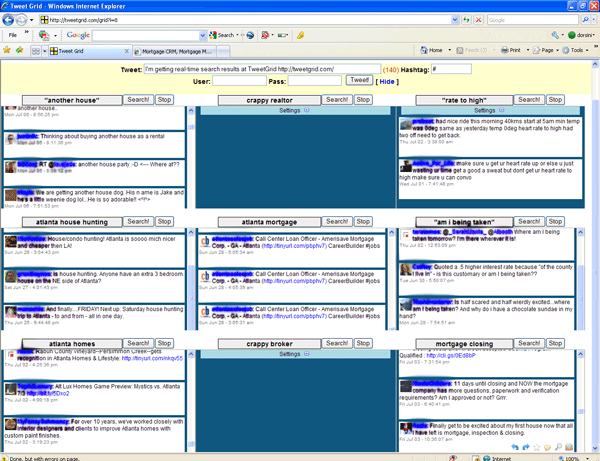 With Tweet Grid you can have up to 9 searches happening simultaneously and in real time. So as someone tweets (I really hate saying that word, and hate typing it worse) the question "am I being taken by my broker? ", you can be one of the very first people to see it. Take a look at the grid image below. Ahh, who am I kidding? The image is way too small to see all of the text. Click on the image to see it full size. I have blurred out the screen names of the twits (users of Twitter?) to protect the innocent; but you can see what they are typing that match my search criteria. Someone thinking about buying another house as a rental - maybe they need financing. 3 people are house hunting in my home town of Atlanta - maybe they need financing as well. 11 days before the scheduled closing someone is getting some bad vibes from their mortgage company - maybe they could use a second opinion, you may not win the business this time since it is so close to closing, but you could use this opportunity to earn their trust, then maybe add them to your mortgage marketing campaign and be there to earn their business next time. Someone who thinks they are being taken by their broker because they were quoted a .5 higher interest rate because of the county they live in - come in with an honest quote and educate this prospect and I bet the business is yours. And all of these examples are just from right now as I type this post. I may not be a big fan of the concept of Twitter; but as a business owner I know that if people want to talk about needing my services then I certainly need to listen.